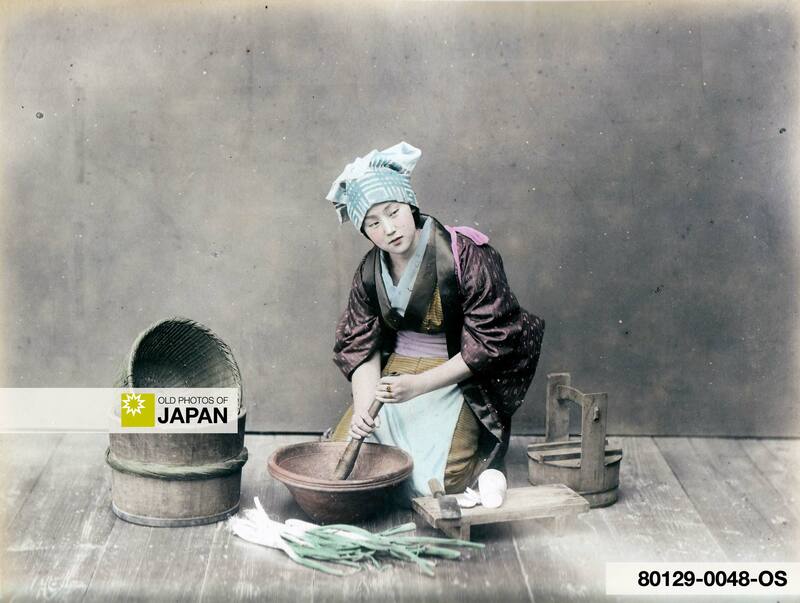 In this studio photo of daily kitchen work, a woman wearing a hokkaburi (頬っ被り, headwear) is grinding something in an earthenware suribachi (mortar). Daikon (radish) and a knife lay on the mainata (wooden board). Next to the mainata is a meshibitsu (rice tub). On the other side is an oke (wooden bucket) and a kago (reed basket). The suribachi was, and often still is, an important tool in the Japanese kicthen. It was especially used for grinding sesame seeds or mashing miso. Japanese hairstyles were extremely elaborate and contained a lot of wax. Housewives and working women used the hokkaburi to protect their hair from dust and dirt while working. You can also licence this image online: 80129-0048 @ MeijiShowa.com.